In 1955-1966 Pedigree shifted their soft toy manufacturing business to Belfast in Norther Ireland. Their soft toys had a cloth label stitched into the back seam of their body. 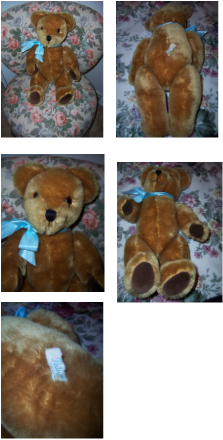 Our bear seems almost like new and has a great covering of golden mohair all over his body. His velveteen paw pads have little to no wear to them.
. amber and black plastic eyes.
. ears contain bells and make a jingling sound when shaken. .straight legs with velveteen paw pads which had no claw stitching. We have given him a new blue satin bow around his neck.